Back to the berries today. As strawberries are still being sold in large amounts on the farmers market, we bought 3 boxes again today. Going with the strawberries, I used oranges, apples, mint and yogurt for this Sunday Smoothie. Apple; fresh apples help cleanse the system, lower blood cholesterol levels, keep blood sugar level up and aid digestion. Apples help to eliminate toxins in the system. Apples contain vitamins A and some vitamins B and C. Apples also are high in two important phytochemicals: pectin and boron. Orange; all citrus fruits are high in vitamin C and limonene, which is thought to inhibit breast cancer. Oranges in particular can be good for improving mental functions, as they are a good source of choline. 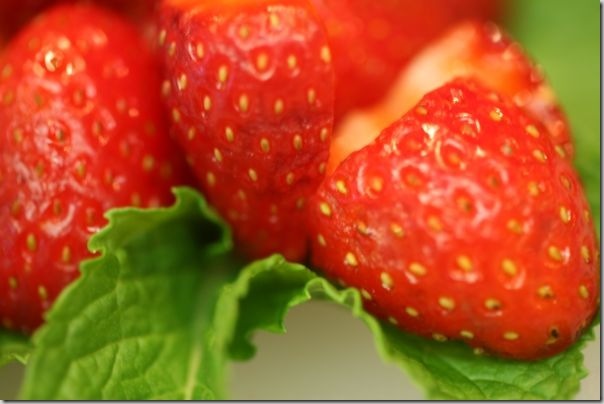 Strawberry; strawberry can be effective against kidney stones, rheumatism and arthritis. Next to this, strawberries are also used in cleansing juices and as a mild tonic for the liver. This fruit is high in cancer fighting ellagic acid and vitamin C. Strawberries not only contain vitamin C, but also vitamin A and potassium and some iron. Mint; although mint is now days used a lot in tea, you can perfectly give your smoothie an extra bite by using a couple of leaves of mint in it. Mint can help to treat stomach ache or chest pain. Mint also helps digestion in a way that it breaks down the fats. Because if this, mint is sometimes recommended for treatment of obesity. Fresh mint leaves need to be used immediately, or stored in a plastic bag for just a couple of days in the refrigerator. 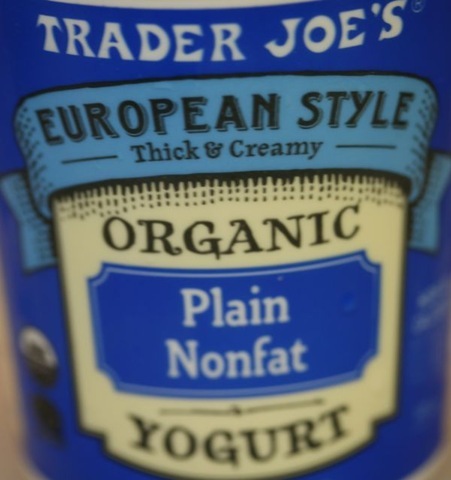 Yogurt; yogurt can restore and maintain the normal microbial balance in the intestinal tract. For smoothies you can use it to give the drink a somewhat different taste than just mixed fruit. A thick and creamy yogurt can give your thin smoothie more body. For the Yogurt I always use the organic low fat yogurt from the Trader Joe’s. 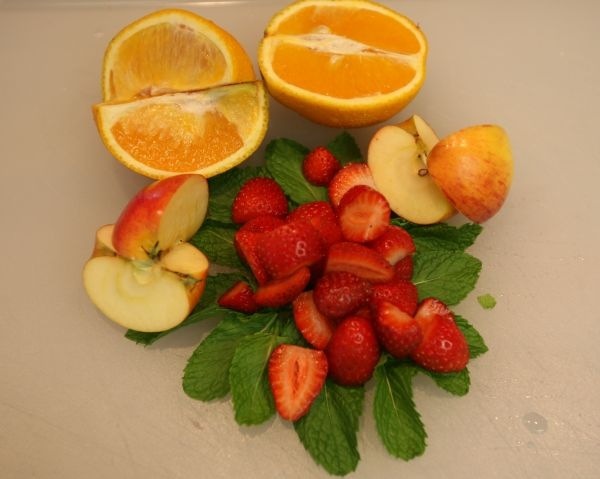 With the summer almost at an end, the fruity fruit are delicious and sweet. So, Sunday morning, the first trip out is to the farmers market to pick up some fresh fruit for the Sunday Smoothie. Today we picked up Apples, Pears and Peaches and a lot of Bananas. To give the smoothie some extra bite, I added Mint and a lot of Basil. Apples; fresh apples help cleanse the system, lower blood cholesterol levels, keep blood sugar level up and aid digestion. Apples help to eliminate toxins in the system. Apples contain vitamins A and some vitamins B and C. Apples also are high in two important phytochemicals: pectin and boron. Peach; peaches are full with antioxidants, rich in vitamin A and potassium. 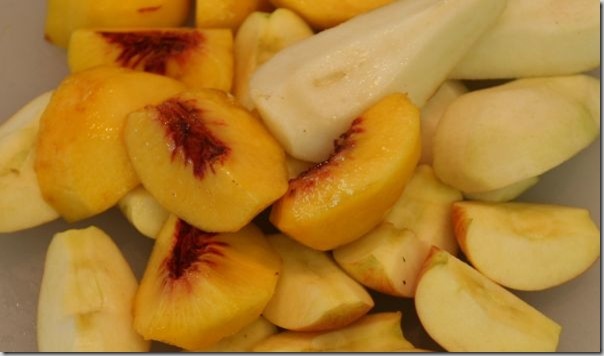 Peaches also contain Boron, niacin, some iron and Vitamin C. Peaches can help against cancer or heart disease. Although they contain low sugar, peaches taste very sweet. 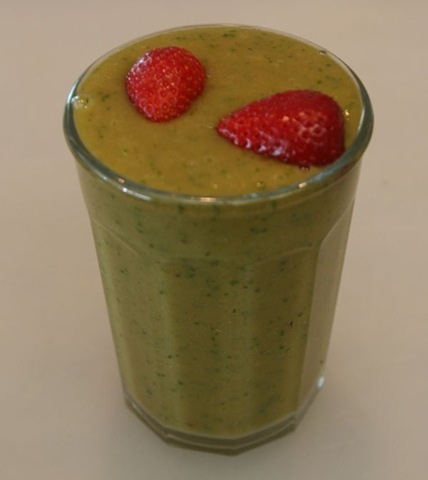 They can make the smoothie a little thick, so combined with bananas, you might need a spoon. Pear; pears are a good source of vitamin C. They can add a sweet taste to the smoothie. 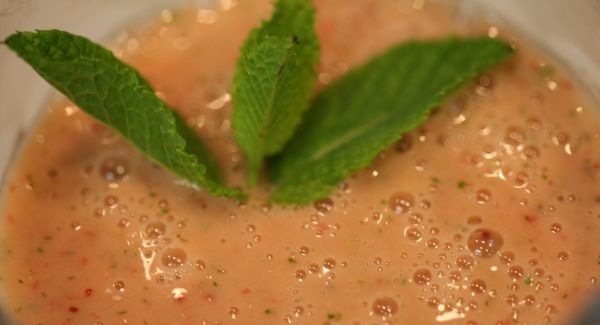 Just make sure the pears you use are not hard, but ripe enough so they can add to the liquidity of the smoothie. Pears protect the colon too. Basil; can help you with your indigestion nervous tension, stress and tension headaches. Just use 1-3 leaves in your smoothie per each cup. Peeling the fruit is the most work. After this, it’s easy, just blend! 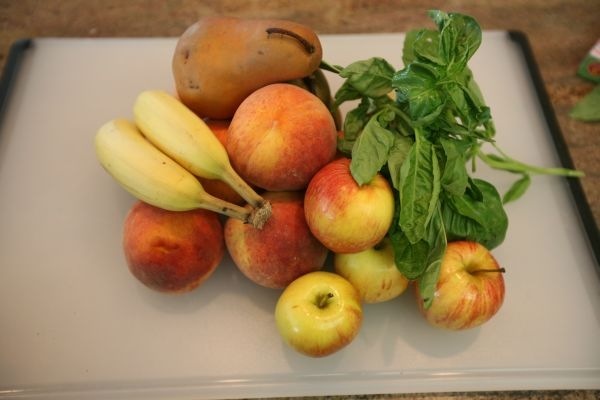 The smoothie’s viscosity is pretty high because of the banana’s and the peaches. The strawberries were floating on top of the thick smoothie. 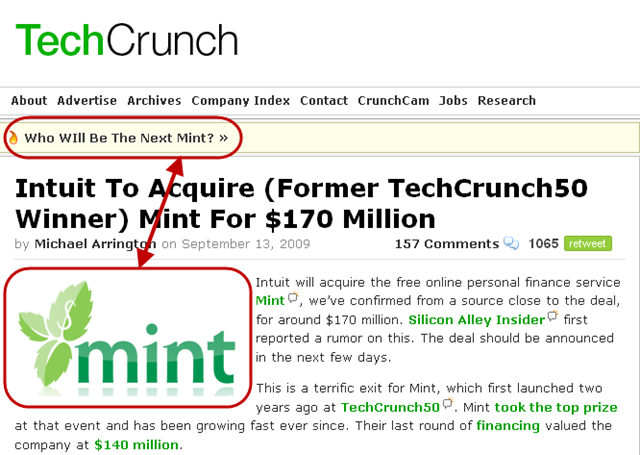 Just two years after winning the Techcrunch 40, Mint.com has been sold for a whopping $170 million dollar. Two ex-eBay colleagues are counting the premium on their options right now, congrats. 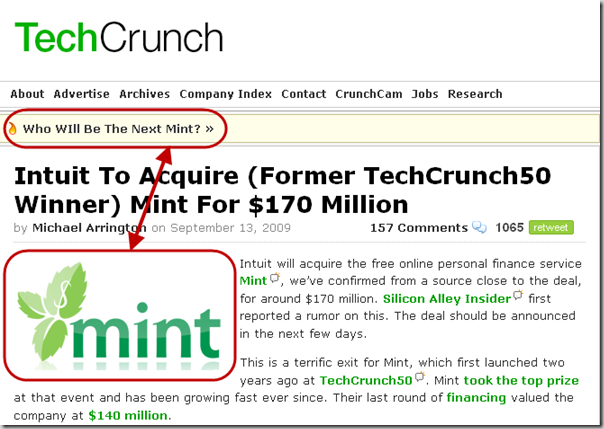 But what was more interesting and funny, was that the news broke on the first day of the Techcrunch 50 today. This proves the demo of startups can give that extra push for a concept, although the team still needs to execute.